Here’s a BIG list of 4th of July events in DFW, including where you can watch fireworks. If you know of one that we haven’t listed, leave a comment below and let us know! Updated for 2018. Enjoy pre-game concert by a Beatles tribute band. After the final pitch, keep your seat for a fireworks show set to Beatles hits. After the final out of the game, visitors are welcome to keep their seats for a post-game fireworks display. Games start at 7:05 p.m.
Family-friendly event for all ages with live music, games and activities, diverse food options and fireworks. Festivities start at 4pm. From June 30 – July 4 at Six Flags Over Texas: exclusive ride times, fireworks all five nights, festive foods, and more! Activities for all ages including rides, food trucks, live entertainment and fireworks; 6-10pm. Presented by Fort Worth Symphony and located at Fort Worth Botanic Garden, Monday – Wednesday at 8:15 pm. Bring the whole family as we celebrate America’s Independence Day from 6-10pm. Don’t miss the music, the food, and the live fireworks as they light up Dallas’ beautiful skyline. Celebrate America with us on July 3rd & 4th for live racing, live music by Vegas Stars from 4:00 p.m. to 10:00 p.m. and our expanded Family Fun Park with bounce houses, face painters, tattoo artists, pony rides, a petting zoo and much more from 3:00 p.m. to 9:00 p.m.
Heritage Park. Live entertainment, activities, food, vendors, bounce houses, contests, and of course, fireworks. Bring your lawn chairs, blankets, and bug spray! and join us for an evening of good, old-fashioned family fun. Patriotic celebration that kicks off on July 3 with down home fun including tailgating, food trucks, a children’s area, a DJ and music by Memphis Soul, and the HEB fireworks show. Festive family fun in downtown Arlington starting at 9am. See Light Up Arlington Fireworks information above for Tuesday, July 3rd. Apogee Stadium; activities start at 6pm. Fort Worth’s Fourth on the Trinity River with kids zone, tubing and live music, flyover. Gates open at 2 p.m., live music throughout the day, fireworks at 10 p.m. Celebrate America’s freedom at Independence Fest in Flower Mound at Bakersfield Park. Children’s parade at 10am; evening activities 5pm – 10:30pm with fireworks scheduled for 9:50pm. Frisco Freedom Fest begins at 4pm with a full evening of family friendly entertainment. Fireworks Extravaganza at the stadium at about 10pm. Annual parade honoring veterans begins at 10 a.m. in historic downtown. A picnic in Getzendaner Park follows. 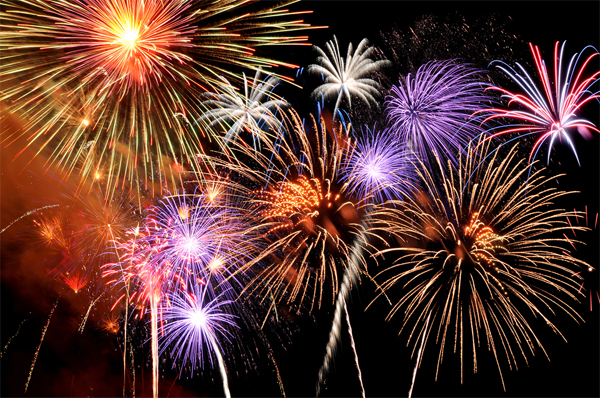 Know of other fireworks displays and Fourth of July events? Post a comment below and let us know!